In recent months, a cottage industry has emerged on Wall Street trying to quantify the impact from escalating trade war with China, with reports coming out fast and furious with predictions, some dire, others innocuous trying to capture what a worst case scenario would look like, and today was no exception. 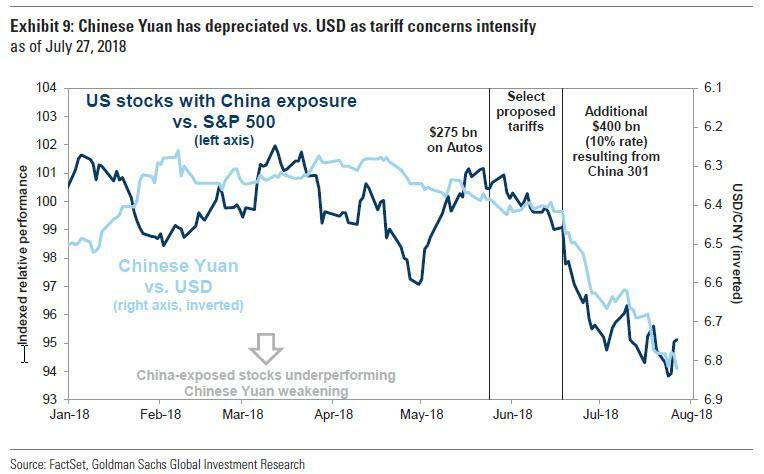 In a report from Goldman's David Kostin, the equity strategist departs from the traditional angle of looking at the hit to the overall economy and GDP, and takes a slightly different angle in evaluating trade war impact, which he analyzes in terms of foreign revenue exposur of US companies - and to infer how the bank's three tariff scenarios would impact S&P earnings. According to Goldman calculations, S&P 500 companies in aggregate derived 30% of revenues from international sources, compared with 29% in 2016. At a sector level, Information Technology and Materials have the highest international exposure, representing 60% and 49% of total sector sales, respectively. On the other hand, the most domestic-facing sectors were Telecom Services and Utilities, which both generated 96% of revenues in the US. First, ongoing trade tensions pose the most risk to companies with high exposure to trade between the affected countries, notably China and the US. As a whole, tariffs will weigh on S&P 500 earnings in two ways: lower export revenues and lower margins resulting from higher input costs. The risk of lower export revenues to be minor: only two percent of S&P 500 sales are from China. The impact of a 10% tariff on Chinese imports would be more substantial, lowering our 2019 S&P 500 EPS estimate by three percent. While we estimate the impact to be limited on the index level, companies with a large portion of sales to China are more exposed. Second, relative GDP growth is another important driver of the performance of our geographic baskets. As US GDP growth rises relative to global, domestic-facing stocks outperform stocks with the highest international sales exposure. Higher global ex-US GDP growth often implies better growth prospects for companies with significant exposure to non-US regions, which in turn drives equity performance. 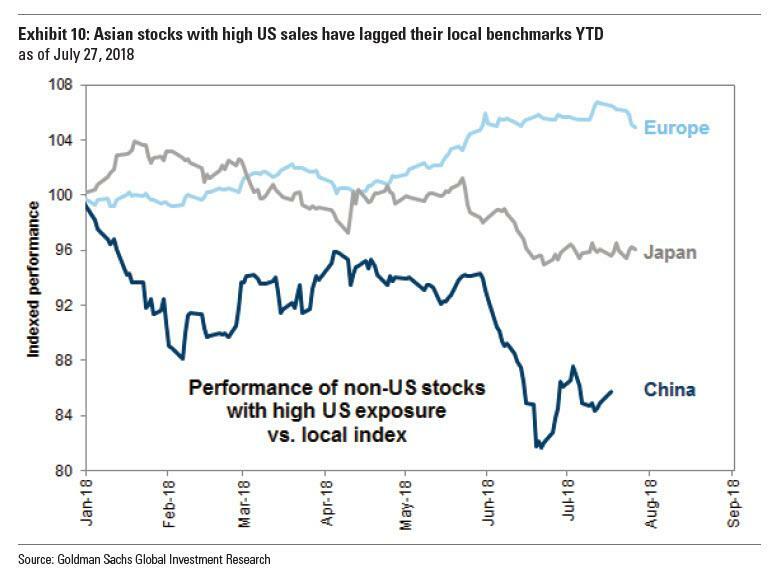 Predictably, Kostin notes that stocks exposed to trade between the US and China have underperformed, although he observes that "the market appears less concerned about trade tensions with Europe." In particular, US and Chinese stocks most affected by the cross-border conflict have trailed their respective market indices by 6 pp and 8 pp since trade discussions became more involved in March. However, a basket of European stocks with the highest US sales exposure outperformed the STOXX 600 (8% vs. 3%) over the same period. Going back to the above point how tariffs, both implemented and proposed, will impact S&P 500 earnings, Kostin lays out two ways: (1) lower export revenues and (2) lower margins due to higher input costs. We estimate the impact of the first to be minimal, using GS Economics’ demand-side estimates for a multilateral trade war in which every country imposes a 5% tariff on every other country. Using the resulting decrease of 20 bp and 10 bp for US and World GDP would reduce our 2019 S&P 500 EPS forecast by 1% to $169. 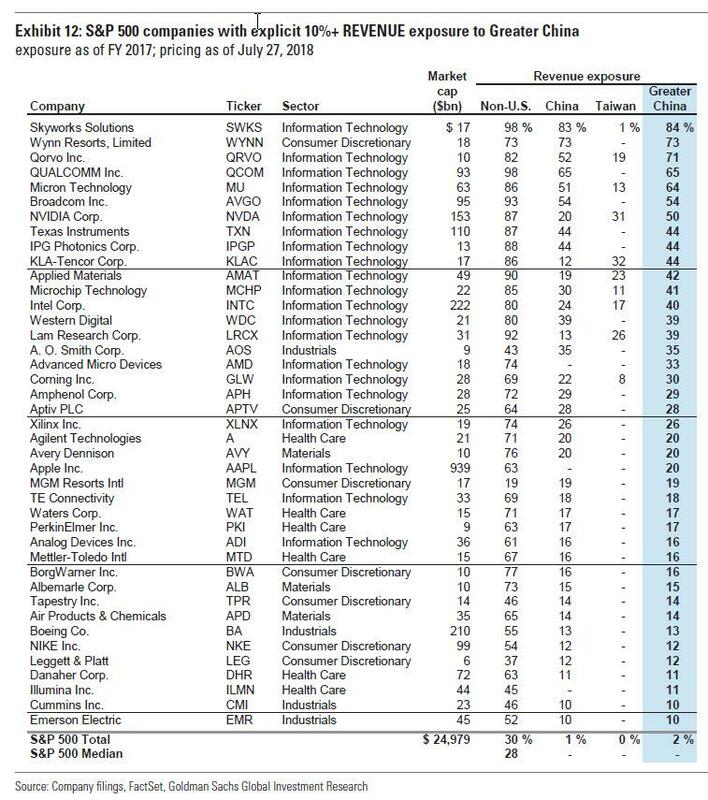 While none of that is surprising, Goldman finds that even a worst case scenario - a 10% tariff on all imports from China - which Kostin calls a serious escalation from current talks, would result in a potential 3% revision to our top-down 2019 S&P 500 EPS estimate of $170. we laid out a scenario analysis assessing the potential impact of escalating tariff rates on S&P 500 EPS. Using our estimate that S&P 500 firms import 30% of COGS (double the 15% for all US industry), and assuming (a) no supplier substitution, (b) no pass-through of costs, (c) no change in economic activity, and (d) no benefit to domestic producers, a 10% tariff on all imports from China would lower our 2019 EPS estimate by 3% to $165. And, extending the "severe" scenario's 10% tariff to all US imports would see Goldman cut its EPS estimate by 15% to $145. the CNY will be more stable, as further depreciation of the currency could be viewed by the US as retaliation against the tariffs. So far, however, none of these have materialized and the offshore Yuan today tumbled to a fresh one year low as Beijing clearly is encouraging devaluation of the currency. One reason for this may be the disproportionately adverse response for Chinese stocks that have US exposure, compared to Japanese or European stocks, which leaves China with just non-traditional responses to Trump's tariffs. If trade tensions continue to rise and new tariffs are proposed and implemented, stocks with the highest domestic sales exposure should outperform. A stronger US dollar and above-trend US economic growth would support this basket, which carries a similar P/E to the S&P 500 (17.1x vs. 17.6x). However, analysts expect a prospective Sharpe ratio of just 0.4, below the S&P 500 median of 0.5. We highlight stocks with over 10% revenue or asset exposure to Greater China. These firms are heavily concentrated in Info Tech, specifically Semiconductors and Semiconductor Equipment. Investors are pricing the US-China dispute, but appear less concerned about an escalation of trade tensions between the US and Europe. 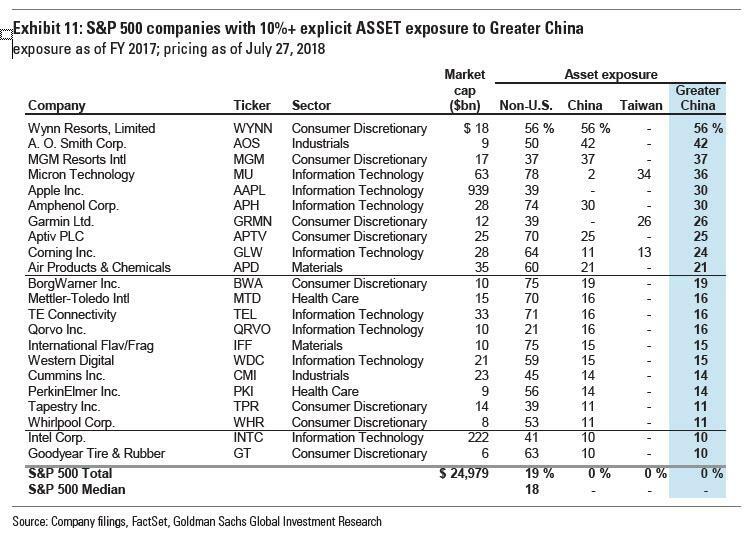 Finally, Goldman also highlight S&P 500 firms with more than 10% asset exposure to China despite limited revenue exposure because these firms may need to make costly alterations to their supply chains. In fact, the management teams of Amphenol (APH), Whirlpool (WHR), and others expressed in their 2Q 2018 earnings calls the need to adapt, via localization or efficiency gains. Twenty-two S&P 500 firms report at least 10% of reported assets in Greater China.